In a bowl, mix together all ingredients except bread. Place the bread, in two layers, in a well-greased square baking pan. Pour the egg and milk mixture evenly over the bread and let it sit in the refrigerator for at least 15 minutes until it is all soaked into the bread. Bake for 25 minutes, then place 5 thin slices of butter on the top of the bread and bake for another 5 minutes, or until done. Serve with butter and plenty of syrup. Looking for a great breakfast recipe to take the edge off your St. Patrick's party fun the night before? Look no further. 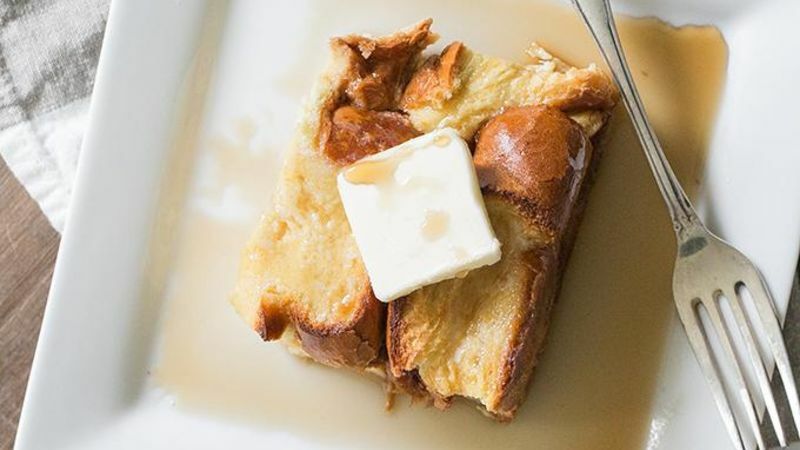 Like having the magic of the Irish to help, this French toast bake is super easy. And with Baileys in the mix, you know it's delicious! Making French toast or pancakes the traditional way, a few at a time, can be time consuming – and it's challenging to keep everything warm when serving all at once. That's why I'm officially obsessed with baked French toast! It's incredibly easy to make, and this recipe with challah bread and Irish Cream is off the charts amazing. I'm not sure I'll ever go back to “real” French toast. I promise, you won't be disappointed with this recipe! Serve with butter and syrup and enjoy!